Loving Abundantly: Motherhood Edition | Less. More. Abundantly. Shanna Groves has an insightful blog up asking, essentially, how to love abundantly as a Mother. Read it here: Great Blog on “What Kind of Mother Should I Be. Recently, in an effort to commit fully to a less-more-abundant life, I have stepped back from working a ‘real’ job. I am concentrating, for the first time ever, on really building a consulting and writing career. It means, for the first time, I am home with my children for the entire summer. No camps. No day care. Just me. I, like Shanna, wondered what I was really doing to show my kids I loved them. Were the slurpy noodles and brown soup served on trays enough? Was the one on one time learning how to write, cheering every hard-won inch of growth, important? The Wii tournaments where I would get slaughtered by my 5-year-old, did that show him love abundantly? 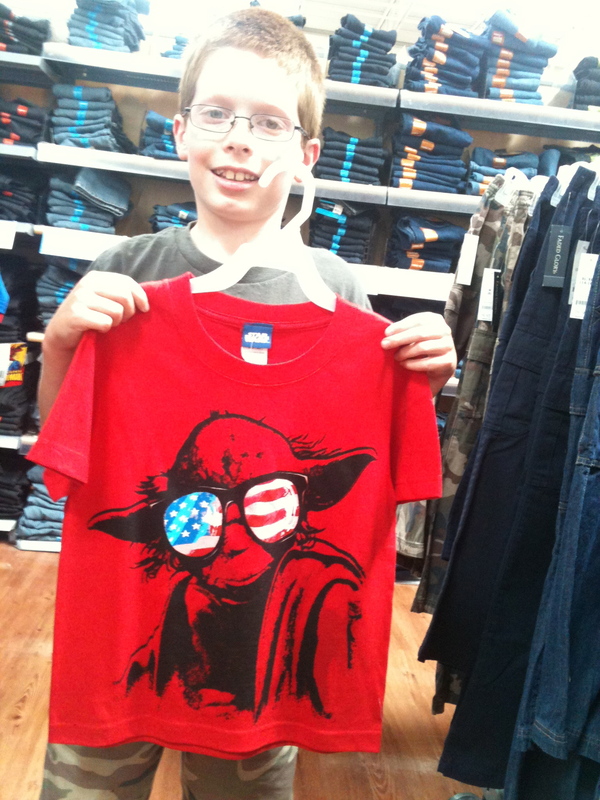 Was the purchase of the utterly ridiculous t-shirt a way to touch his 9-year-old heart? Or was it the whispered conversations long after bedtime with my 9-year-old? Topics ranging from Lego building conundrums to worrying about the new school year. Or was it the run/jump/launch/hug of my 5-year-old (my back protesting) which filled his heart? I did ask them to watch toons so I could work. I did leave them in the more than capable care of Pap to get shopping and writing done. I did lose it more than once. My 9-year-old once answered the question, “How was your day so far?” with this, “Well, it was good until my Mom cussed me out this morning!” Not my most abundant day to be sure. Today we cheered when my oldest conquered a level in his Star Wars Wii game he’s been working on for two whole years! Is that love abundant? There are the ad nauseam arguments of quality versus quantity. There are the ‘helicopter’ moms hovering over their children every minute of every day. There are the ‘sidelines’ moms who prefer to watch and get on the field only when they need to. I’m still figuring it all out. Perhaps it isn’t the answer which is important. Maybe it’s the question which will keep me loving abundantly. Beautiful closing paragraph. Thank you so much for the mention.